The warm climate and the sea may render Spain a desirable tourist destination for millions of people around the world, but the residents’ relaxed attitude towards life extended to the country’s stand on gambling, with a number of brick-and-mortar and online casinos going unregulated for years. Yet, participating in different forms of gambling is a popular pastime among many Spanish residents as various reports suggest that players from the country collectively spend as much as €1.9 billion on betting per year. The financial crash of 2008 put an end to the unregulated market in the country and led to the enforcement of the so-called Spanish Gambling Act, with lawmakers adopting a stricter attitude towards all gambling activities that take place on Spanish soil. Gambling in brick-and-mortar venues has been legal on the territory of Spain for nearly forty years but the country did not enforce proper regulations on this market until recently. At the present moment, both online and offline gambling are legal and regulated on a national level but this was not always so. Games of skill became legal in 1977 while slot machines and other similar games that are based on luck were approved in 1981. It is fair to say the landbased gambling industry in the country is flourishing as there are over sixty licensed gambling venues and as many as seven racetracks across Spain at the present moment. The thriving landbased gambling market has led to some changes being made to the Spanish legislation regarding interactive betting as well. In 2006, the country’s government officially enforced its first laws concerning interactive gambling, with online sports betting being the first form of gambling to be subjected to regulations. The government proceeded with setting up a special commission in 2010 in order to outline the guidelines on how a properly regulated interactive gambling sector should operate. 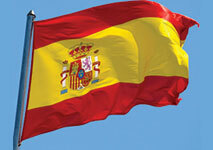 This led to the introduction of one very important piece of legislation, namely the 2011 Spanish Gambling Act. The latter was officially enforced in 2012 and all forms of online gambling in the country became legal. The Act allowed for a more holistic approach towards gambling regulations – the 17 autonomous communities in Spain oversee landbased betting activities while the central government in the capital, Madrid controls the gambling regulations on a national scale. The autonomous communities are currently responsible for landbased operations only while interactive gambling activities, which take place over the internet and thus, transcend the country’s physical borders, are overseen by the state, in the face of the General Directorate for the Regulation of Gambling Activities. The Spanish Gambling Act also covers the promotion and sponsorship of gambling activities. Thus, foreign gambling operators that do not hold valid licenses from the local regulatory body are prohibited from advertising their services and products to Spanish residents. The advertisement and promotion of gambling activities on behalf of local media are also subjected to authorization from the government. That being said, some foreign gambling operators are reluctant to apply for a Spanish license because of the hefty taxes, imposed by the government. However, despite the strict regulations that are applicable for interactive gaming providers, individual players are not persecuted for betting on unlicensed foreign websites. In order to legally offer their services to residents of the country, foreign gambling operators need to apply for and receive a Spanish license by the local regulatory body. The governmental body that regulates the market and issues licenses to online gambling providers is called the General Directorate for the Regulation of Gambling Activities and operates as a part of the Ministry of Finance and Public Administration. In addition to market supervision, this institution is also responsible for managing various gambling records and penalizing unauthorized gambling activities on the territory of Spain. Gambling providers that operate in violation with the guidelines of the General Directorate risk having their licenses revoked. The General Directorate grants three types of licenses – general ones, single-game ones, and permits which are valid for brief periods of time. The licenses and regulations cover fixed-odds sports betting and horse racing, mutual sports betting, exchange betting, bingo, slots, baccarat, blackjack, roulette, and poker. The licenses are not transferable and the period they are valid for depends on their type. For example, the general licenses expire after ten years while single-game licenses are valid for a shorter period of time, ranging from one to five years. The General Directorate also issues permits for occasional, i.e. one-time gambling activities. The foreign gambling operators need to comply with several requirements set forth by the General Directorate. For instance, one of the conditions is for the operators’ gambling central units or servers to be located within the country’s borders so that Spanish authorities can adequately monitor them. Additionally, the license applicants are expected to submit an operation plan that includes the results of the full tests their gambling software has undergone. Some of the biggest names in the online casino industry have already entered the Spanish market and run websites via the .es domain. These include popular, reliable and highly respected online gambling operators the likes of William Hill, bet365, partypoker, PokerStars, and 888casino, among others. Poker fans from Spain are enabled to partake in a variety of online tournaments and cash games with flexible stakes ranges. Furthermore, it is possible to choose from a wide range of secure payment options that are suitable for players from Spain, including convenient options like e-wallets, prepaid vouchers, credit/debit cards, and internet banking. Spanish players also get the chance to deposit in their own currency as all licensed gambling operators have adopted the EUR, preventing their customers from incurring additional currency conversion fees. Also, players who are not fluent enough in English will hardly experience any difficulties with processing payments, managing their accounts or claiming bonuses since many online gambling operators list Spanish among the languages supported by their websites. Obtaining a gambling license for operation within the borders of Spain implies the payment of taxes on behalf of the licensees. As was mentioned earlier, the taxes in Spain are rather hefty. All licensed online gambling operators are expected to contribute 25% of their gross revenue. There is also a corporation tax which is generally around 30% but can drop as low as 20% – it all depends on how big the company is. Meanwhile, gambling operators that violate the guidelines set forth by the General Directorate by offering their services to Spanish residents without a license risk incurring even heftier fees of up to €50 million. The weird thing when it comes to Spain is that taxes are imposed on the winnings of Spanish players as well, which is not the case in most European countries where online gambling is legal and regulated. Players who declare gambling as their official source of income are required to pay a 20% tax on their lottery or betting profits, provided that the latter exceed the amount of €2,500. On the bright side, Spanish players are allowed to deduct their losses from their profits. The gambling operators that are licensed to provide betting services to Spanish citizens are also expected to conduct their operations via the .es domain. Thus, each time a player from the country loads the website of a licensed gambling provider, the connection will be redirected to the Spanish domain. Despite the fact both gambling operators and Spanish players are dissatisfied with the imposing taxes they are expected to pay, the online gambling industry in the country is thriving. Various reports published by the General Directorate for the Regulation of Gambling Activities indicate that the Spanish gambling market has been on the rise in the past few years, with profits from this sector reaching an all-time high in 2016. There was a significant increase in revenue from sports betting and virtual casino games. Online poker, on the other hand, is not doing that well since there was a drop in the overall amount Spanish players have wagered for the same period. This decrease in online poker revenue in Spain can be attributed to the policy of the country’s regulatory body of segregating Spanish players by allowing them to be seated at online poker tables with other players from the country only, which renders it difficult for this particular market to grow. This also causes Spanish poker fans to resort to playing at unlicensed poker websites which further reduces the country’s revenue from this sector of the gambling industry. Despite that, the legal changes enforced by the Spanish government in recent years have allowed for a significant market growth, providing players from the country with a greater number of licensed (and therefore reliable) online gambling websites to choose from. Yet, lowering the taxes imposed on licensed operators most definitely would have a positive effect on the Spanish gambling market’s further growth.